I have had allergy issues my entire life. I started allergy shots two different times over the years, but moves caused me to not finish them out. Amazingly, I have noticed my greatest relief in the last 2-3 years. This is also the time when I went mostly vegan. Absolutely, I believe there is a correlation. Granted, I have some medication allergies, as well. I avoid penicillin and sulpha, as they give me massive hives and put me at risk for a fatal reaction (which is a major downer). In high school, I also had a very strange reaction to an over-the-counter med. I developed about eight really large welts (hives) on random areas of my body. It was miserable. As you can imagine, it was also EXTREMELY attractive (one being on my eye - lovely). I eventually ended up with a round of steroids to make them go away. In college, I took some Dramamine, and realized quickly I was having the same reaction. I forgot my sea bands on my recent flight to Chicago. Stopped in the airport and grabbed some Dramamine. I have not had a reaction to any medication in years. I had strictly avoided Dramamine. Strict avoidance can be a precursor to overcoming lesser reactions. What could it hurt? Five days later, I was a mess. I was not only reacting to the medicine, but it triggered a few other very (very, very, very, very, very) not-fun issues in my body. Needless to say, all of my new friends in Chicago now know why I jumped into an improv activity with, "Thankfully they make medication for such an embarrassing itch!" IT'S ALL I COULD THINK ABOUT. I started rounds of Benadryl, and it was barely touching it. In fact, I was starting to wonder if I wasn't starting to react to Benadryl (a close cousin to Dramamine - FYI, I HATE that family!). Two days ago I started to make the calculations in my head, "Okay, if I go into the weekend like this, I'm hitting a minor emergency clinic on Saturday and we're going to steroid the bajeebiz out of this thing." I don't like steroids, and try to avoid them when possible. But this was bad. IT WAS HAZMAT SUIT BAD. Then, two nights ago, I was looking around to find out if, indeed, I was developing an allergy to Bendryl on top of everything else. Whadda' ya' know. Something grabbed my attention. 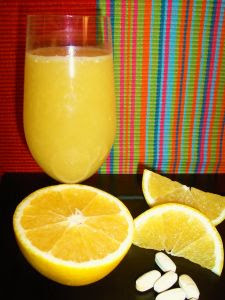 Vitamin C is a natural antihistimine. Now, half of you were already yelling this at me, just reading my post. I have heard this before. I have read this before. But in my itchy stupor, I could not recall my phone number, much less some vitamin brilliance. What is a half-hippie to do? I went over to see what 'ole Andrew Saul had to say. "Take enough C to be symptom free, whatever the amount might be... but stay a few thousand milligrams under the amount that would cause loose bowels." That last part is my favorite. I guess if I overdid it, I'll have something else to blog about in a few days. Last night I started to notice a little inflammation returning in my eye and mouth. Some more Vitamin C ... within an hour it was fading. And next time I'll just barf on the plane. That's awesome! Did you take the C in any particular form (juice, supplements, whole oranges)? Does it matter much? 4000 mg seems to be the right spot for me, at this point. i hadn't heard this about vit C - interestingly enough tho i discovered in Jan that is will almost totally relieve current throat issues related to eating - ya got me thinking about this in a whole new way Christine - thx for sharing and glad you're feeling better! ~*head smack*~ DOH! I've so had those moments! Mine did not involve loose bowels, krazee itchiness, or pukage but yeah, I've had those DOH! moments! My fav. new find of the Spring? Propolis! Controlling my allergies like nevah before! I did not know the vitamin C thing. Did you know alfalfa is also a natural way to control allergies? I'm gonna have to try the vitamin C thing because if I go in for more allergy testing I will have to stay away from benedryl fo 2 whole weeks, which I can not even imagine right now, especially since everything is blooming. I'm taking a moment of gratitude for my allergy-free life (something I'm frequently taking gratitude moments for), but I also wanted to mention my experience with vitamin C and the "loose bowels" issue. I take Vitamin C in enormous doses when I feel a cold coming on. And "experts" can argue all they want about the effectiveness, but I know this: if I take that amount of Vit. C when I DON'T feel a cold coming on, I will be spending some Sad Time on the toilet. Perhaps as long as Sad Hours. But no amount of Vit. C can cause that reaction when I'm fighting a cold. Clearly my body is doing SOMETHING different with it than it does when I'm not fighting a cold. (And of course my belief is that what my body is doing with the Vit. C is fighting off the cold, but I know doctors don't necessarily agree). I'll certainly try to keep your Vit. C advice in mind should I ever get myself into an inflammation problem! I just have to say, tho, barfing on the plane? I've done it more than once, and it's incredibly unpleasant. Because the NOISE and the SMELL tend to make other passengers barf after you. BEEN THERE. No. Fun. At. ALL. I was thinking "OMG! We're dealing with allergies at my house and the great Christine talks about allergies! YEA! The local honey we've been using to fight seasonal allergies apparently wasn't enough to stop my daughter's severe congestion. Then you said Vitamin C. *sigh* My daughter and I are allergic to citric acid. It's hard to find Vit. C that doesn't have citric acid as an ingredient. Very interesting! Sorry you have been suffering so, C! I give my nephew a big allergy shot every week and of course he hates it so I'll have to see if his mother has tried C and wheatgrass(?). I have never ever heard of being allergic to benadryl!!! Isn't THAT a kick in the pants? FYI - raw, local honey is amazing for environmental allergies. I take vitamin c as well, but not in the doses listed above. I take about 2000 or 3000 mg, but will start upping it. Warning, high doses of Vitamin C can interact with other medications like antibiotics and birth control. My nephew was a surprise Vitamin C baby (my sister took high doses to prevent kidney infections and hadn't been warned).